1. 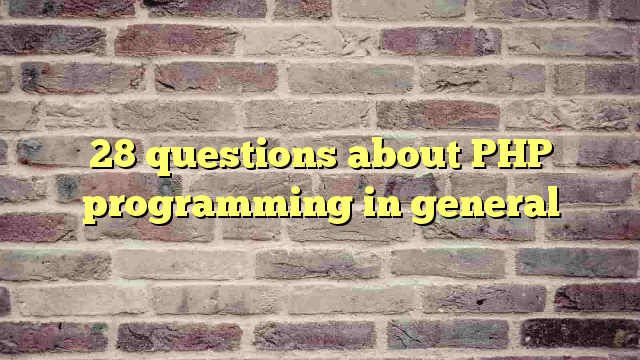 How PHP is different from other programming language? 2. What are basic and main features of PHP? 3. A brief history of PHP? 4. Can we use the PHP for desktop application development? 5. What are PHP data types? 6. How we can install the PHP on windows? 7. How we can install the PHP on Linux? 8. How we can install the PHP on Mac? 9. How PHP is platform independent? 10. How we can customize the PHP behaviour in our installation? 11. How we can install new PHP modules in our installation? 12. How Zend Engine works? 13. What are popular PHP modules? 14. How we can get information about PHP execution of a script? 15. How PHP can be used as a shell script? 16. How comparisons of variables work in PHP? 17. What are constants? How they are different from variables? 18. How time zones can be handled in PHP? 19. Why PHP usually called functional language? 20. What is ternary operator and how it has to be used? Give some examples. 21. What are binary and hexa numbers in PHP? 22. Mention common mistakes programmer usually do while working in PHP? 23. What is the safe mode in PHP? 24. What are major differences in a script execution on windows and linux? 25. How PHP error handling can be setup and monitored? 26. What are magic quotes and how they can be configured and maintained? 27. How many types of PHP blocks can be used to write php scripts? 28. What are the differences between include and require?